Chesapeake Bay Writers, a chapter of the Virginia Writers Club committed to supporting the literary arts and serving authors in Virginia’s Northern Neck, Middle Peninsula, Williamsburg and surrounding areas, is proud to announce the creation of The Keating Award, an annual literary competition in honor of author and renowned scientist Jean Clarke Keating. The Keating Award will honor Jean’s memory by encouraging writers and the art of writing through the recognition of exceptional work by writers across the country. Monetary prizes will be awarded for first, second, and third place entries where merited in the categories of fiction, non-fiction, and poetry. The call for submissions began on January 1, 2019, and the final deadline for entries is March 1, 2019. The competition is open to members and nonmembers from anywhere in the United States, and a small entrance fee will be collected to help further support the work of Chesapeake Bay Writers. See Contest Rules below for more details. 1. The form for submissions will open on the CBW website on January 1, 2019. All entries are due by March 1, 2019. Late entries will not be accepted. 2. The contest is open to any U.S. resident with the exception of CBW contest administrators and judges. 3. Submissions will be accepted electronically only. All submissions must be previously unpublished works (with the exception of publication as personal blog posts). 4. All entries must be sent in PDF or Word format using a standard 12 pt. font (e.g. Times New Roman, Calibri, Helvetica). Prose submissions (fiction and non-fiction) should be spaced at 1.5 or 2.0; poetry submission spacing is at the author’s discretion. 5. Each submission must have a separate cover sheet file with a title, author’s name, mailing address, email address, phone number, word count (fiction and non-fiction only) and category. The separate document for the entry itself cannot show the author's name. 6. The maximum length for fiction and non-fiction is 2,500 words. For poetry, submissions may be single poems of up to 150 lines or a collection of up to 3 poems, with a maximum of 50 lines each, which will be judged in its entirety. 8. Any submission which does not adhere to contest rules will be disqualified. 9. Monetary prizes of $100, $75, and $50 will be awarded in each category if merited. 10. Each 1st place winner will be contacted by a professional editor/publisher to discuss his/her work. 11. Winners will be notified in May, and a winners’ list will be published on the CBW website. Winners will receive their awards at the June CBW dinner. If you have any questions prior to the opening of the Competition, email CBWreply@gmail.com. Jean C. Keating, born March 3, 1938, received her Bachelor of Science degree from the University of Georgia and her Master of Arts Degree from the George Washington University. A true rocket scientist, she had a key role in the development of the space program at NASA in the 1950s and 1960s, earning NASA’s Special Service Award in 1968. In 1970, she was named Virginia’s Outstanding Young Woman of the Year and one of ten Outstanding Women of the Year recognized nationwide. Jean’s varied and illustrious career included acting as the Assistant Director of Institutional Research at the College of William and Mary and serving on the Virginia State Council for Higher Education. She was also active in volunteer work, chairing the Virginia Lung Association's regional health education committee, serving as president of the Williamsburg Woman's Club, and chairing the leadership development committee of the Virginia Federation of Women's Clubs. 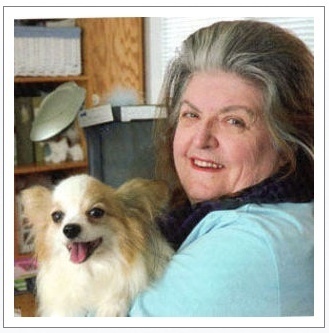 Following her retirement, Jean began a second career as a freelance writer and author, publishing five novels about her beloved Papillons— Amorous Accident, Pawprints on My Heart, Pawprints through the Years, Beguiling Bundle and Love's Enduring Bond and her last book, Animal Heroes and Friends, available at amazon.com. She was a popular speaker, columnist, and champion for the creative arts, and a former book reviewer and columnist for Chesapeake Style and served as president of Chesapeake Bay Writers.